It's about time I actually had a cherry inspired tea cake on here! 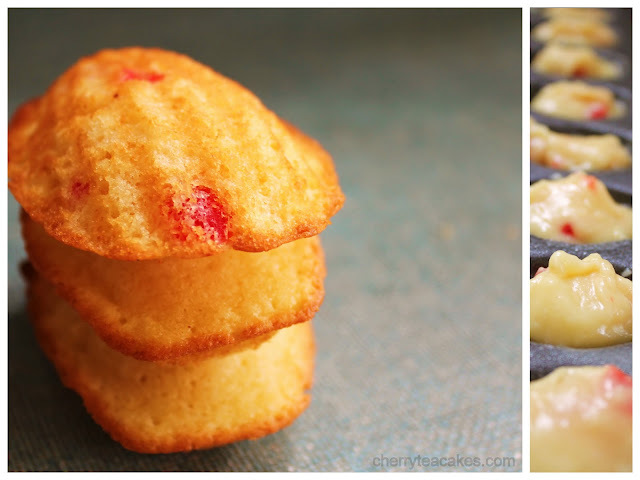 Madeleines are one of my favorite "cookies." Light, airy, delicate and just plain adorable. I adore the added flavor and color of the chopped cherries. It's a great new twist on an old classic! As seen on Photograzing. This last week has been far too busy. I finally did get a night off to try to catch up on sleep. I've needed it. Though I don't get to complain much. If I do, my boyfriend Stephen, the doctor, will start the endless teasing about how hard I work. Sure, he works a 30 hour shift, and I had work, baking, and kickball....okay, he's right. I'm not allowed to complain. My life is pretty good. This weekend I got to have two of my good friends in town, Jenny and Yovhane. We met as juniors in High School on a trip out the DC. After a week of no sleep, laughing until 4 am in our hotel rooms we were too close to be split up. This weekend we had our second DC reunion and brought along the menfolk. Our poor men had never seen the three of us in action. They didn't stand a chance. By the time Sunday evening rolled around I was so exhausted I was just about ready to call it a day at 5 pm and go to sleep obscenely early, but was invited over for a game night. I just can't resist. I needed a quick treat and thought that it was high time I made some Cherry Tea Cakes. Et voila! I mustered up the energy and am so glad I did! The cherries add a rich but mellow sweetness that is very refreshing. Put racks in upper and lower thirds of oven and preheat oven to 350°F. Sift together flour and baking powder into a large bowl. Brush molds with melted butter. Spoon or pipe a rounded tablespoon of batter into each mold, filling it about two-thirds full. With two pans per rack, bake switching position of pans top to bottom halfway through baking. It will be about 10 to 12 minutes total or until the edges are golden brown and a tooth pick inserted comes out clean.